Jeep Wrangler (1987-2006) with NP231 Transfer Case; 31 Links; 1" Width. Jeep Cherokee (1987-2001) with NP231 Transfer Case; 31 Links; 1" Width. Jeep Comanche (1987-1992) with NP231 Transfer Case; 31 Links; 1" Width. 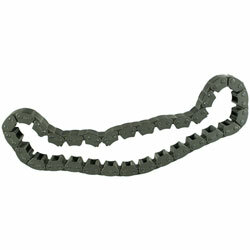 Jeep Grand Cherokee (1993-1997) with NP231 Transfer Case; 31 Links; 1" Width. Jeep Liberty (2002-2007) with NP231 Transfer Case; 31 Links; 1" Width. Dodge Durango (1997-1999) w/ 3.9L engine & NP231 Transfer Case; 31 Links; 1" Width. Dodge Dakota (1997-1999) w/ 3.9L engine & NP231 Transfer Case; 31 Links; 1" Width. Dodge Dakota (2005-2010) w/ NP233 Transfer Case; 31 Links; 1" Width.